of a movie released in 1968. 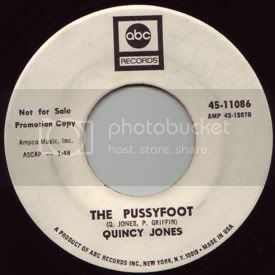 From what I have been able to find out, "The Pussyfoot" did not make it onto the soundtrack LP. A shame, really, as this track is real nice. an organ bubbles up and around the main theme, playful, yet giving it a soulful feel, too. The tambourine jangles fleshes things out, and the drums - when they're in the tune - are truly in a support role: the piano is the real percussion here. This is what I love about jazz and jazzier side of things on 45, the directness. Forget all that soloing and give me a groove I can nod, or even dance, to. Hello from theminx.org New Mastersounds Funk Scene Messageboard. Hope to see you over there!